Warren Buffett worked in relative obscurity for most of his early career, but his success began to attract significant attention by the late 1970s. While Mr. Buffett had not reached celebrity status at that point, dedicated readers of business publications such as The Wall Street Journal should have been familiar with his approach and track record. Modern search engines provide efficient access to news archives so over lunch today we decided to run a quick search of the Wall Street Journal to see when a reader would have been first exposed to Mr. Buffett’s track record. Surprisingly, there are no records of Wall Street Journal articles with the search term “Warren Buffett” prior to 1970. The first search result is a report of a large purchase of Berkshire Hathaway reported on March 26, 1970. An article in early 1977 regarding Blue Chip Stamps buying the Buffalo News is followed by a lengthy page one article on March 31, 1977. 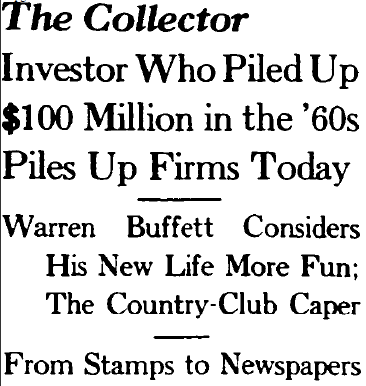 The Collector is the first in depth article in the Wall Street Journal archives detailing Mr. Buffett’s unique investment philosophy. Here are a few excerpts from the article. Note how many of the quotes attributed to Mr. Buffett over 33 years ago sound very similar to the comments he makes today regarding his approach to business and investing. Of course, the same outlook regarding newspapers does not apply today, but the general principle is still relevant. Newspapers suffered from the creative destruction caused by the internet and, more recently the iPad, developments that would have no doubt appeared to be straight out of a science fiction movie from the perspective of an investor in 1977. There are more interesting details in the article regarding the Washington Post investment and the American Express investment during the 1963 salad oil scandal. What is particularly interesting about this article is that any reader of the Wall Street Journal in 1977 should have had all the information required to determine that Berkshire Hathaway was worth a serious look as a potential investment. Any alert investor would have at least been inspired to read the latest annual report. The Wall Street Journal article in 1977 was not even the first major story in a prominent publication regarding Warren Buffett. Forbes ran several articles dating back to 1969 (click on this link for a great compilation of Forbes articles). According to the Wall Street Journal’s historical quote service, the predecessor to Berkshire Hathaway A shares closed at $95 on March 31, 1977, the day the article appeared. It does not appear that the article sparked much interest since Berkshire was still trading in the mid 90s in the weeks after the article was published. This is not to suggest that an investor evaluating Berkshire in 1977 could have had any idea of the massive increase in value that would develop in the years to come, but the company should have at least been on the radar as a potential investment. Investors today should keep this in mind when considering the importance of reading the newspapers in search of potential opportunities. Disclosure: The author owns shares of Berkshire Hathaway and is the author of The Rational Walk’s Berkshire Hathaway 2010 Briefing Book which provides a detailed analysis of the company along with estimates of intrinsic value.